Another Record Falls… India's Koneru Humpy earns GM title! Over the past decade, India has basked in the glory of national hero, GM Viswanathan Anand, an extraordinary chess talent from Madras and winner of 1987 World Junior Championship. He would be followed by the most recent talent of GM Krishnan Saskiran, GM Pentala Harikrishna and now… GM Koneru Humpy, the 1st female from India to earn the "men's" GM title and youngest female ever! 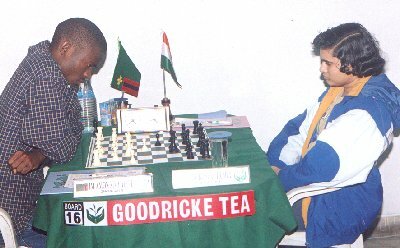 Koneru Humpy (right) playing Zambia's IM Amon Simutowe at the 2001 Goodricke International in Calcutta, India. Humpy (her first name) counts Anand as her chess hero as has certainly emulated his winning ways. She has won four world titles (World U-10, World U-12, World U-14, World Girls' Junior) and at age 15 years, one month and 27 days, she earned her final GM norm at the Elekes Memorial GM tournament. She not only broke GM Judit Polgar's previous record by three months, she did it in Polgar's home country of Hungary! With the recent awarding of the GM title to 12 year-old Sergei Karjakin, it appears that the bar is being raised for young chess talent around the world. India has certainly produced it's share of talent. Like its neighbor China, India enjoys an ancient chess history and is now set to join the world stage as a force to be reckoned with. Anand has praised Humpy calling her (as well as Saskiran and Harikrishna) the future of Indian chess.